The Sofa set is considered as the most important member of furniture family. Though, it is a necessity, yet it is also used for decorative purpose. We are human beings and love to decorate our homes with beautiful things. One such accessory is the furniture. The sofa set manufacturers are offering their range in the comprehensive range of designs and specifications. They are creating their range in beautiful designs so as to meet the diversified requirements of the buyers. What to look for while choosing the range? 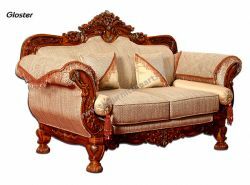 The sofa sets having the wooden frame is highly demanded. The reason for this is that wooden frames help in adding charm and elegance to the place. The artists provide niche designs on the wooden frame. The size of this varies. Most popular variants are the three seater and four seater. It is always recommended to go for the custom size. In this, you have the flexibility to get the range which is prepared according to your space. Some of the homes have small space, while some have the low space. So, you have the flexibility to choose from the size which matches your requirement. Apart from this, you should always check the density of the foam. Moreover, the fabric of the cushion should be chosen as per your preference.